A lovely friend who's a therapist sent round an essay by Dr. Robert Anthony entitled Are You Motivated by Fear? Dr. Anthony explains that most of us stay in our comfort zone precisely because leaving that little nest makes us feel uncomfortable. 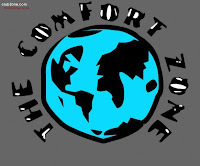 He says, "Uncomfortable is a catchall term that encompasses many emotions; fear, unworthiness, doubt, anger, hurt and distrust, to name a few. Since we have labeled these emotions as bad, we don't want to feel them and so we crawl back into our nests." Except for rare occasions, most of the fear that we experience is over imagined circumstances or consequences. But, since fear keeps us from doing things, we never really check out the validity of the fear itself. A feedback loop of fear --> not doing --> ignorance --> then back to fear develops. [...] Let's look at what happens when the body feels fear; adrenaline, glucose and other energy producing chemicals are released into the bloodstream. Our senses actually sharpen when non-essential fears* such as "Did I remember to [turn off the iron]?" pop up and we gain an instant ability to focus on the task at hand. When we are outside of our comfort zone, most of the time, the only thing we are in danger of is learning something new. What is helpful in learning something new? Energy, clarity and the ability to focus — all available to you via your friend, fear. So, while certain psychologists, mainstream environmental NGOs and several climate scientists keep saying we mustn't frighten the masses by telling them the truth about the climate change emergency we're in and the global catastrophe we're producing, new age therapists and medical doctors know that fear can actually be put to good use. Nothing like a little energy, clarity and focus to help us out of our climate change mess. * I've thought about the use of that term, non-essential fear. I believe Dr. Anthony means we're not talking the "fight or flight" kind of fear here. And, frankly, most people in most industrialized nations haven't been hit hard enough by the ravages of climate change yet to be truly afraid ... it's still a "non-essential fear" (time-wise for us, not magnitude-wise), which gives us time to put our energy, clarity and focus to work.